Whether you’re looking for a quiet weekend getaway or a week-long adventure, you can find the experience you’re looking for at Deep Creek Lake and Lake Pointe Inn. Where is Deep Creek Lake? It’s located in Garrett County in the heart of Western Maryland, an area known for its picturesque mountain views and charming small towns. Deep Creek Lake is situated a few hours outside of Baltimore and Washington, D.C. It has the largest inland body of water in the state of Maryland, accessible at the aptly named Deep Creek Lake State Park. The park attracts thousands of visitors year-round to hike, bike, fish, swim, boat and cross-country ski. In addition to the outdoor activities, toss in a fine selection of delicious restaurants, quaint shops, local fairs and festivals, and a four-season ski and golf resort, Deep Creek Lake truly offers something for everyone. Why should I visit Lake Pointe Inn? Attractions in the Deep Creek Lake area include fairs and festivals, shopping, restaurants, spas and of course, the great outdoors, offering plenty of good reasons to visit in 2015. Annual fairs and festivals include the Autumn Glory Festival, which has been named the No. 1 fall festival by MSN.com. This four-day festival includes 76 events, shows, demonstrations and more. This family-friendly event is held every October when the fall foliage promises to be in full color. The Deep Creek Lake Art and Wine Festival is another popular event held in early September. Meet artists who range from jewelers to painters, as well as sample wine from more than 200 Maryland and national wineries. Enjoy live music, wine pairing dinners and more. If shopping is one of your passions, the Deep Creek Lake area has a number of antique, craft and souvenir shops,as well as apparel, sporting goods, and specialty shops. In addition to enjoying a gourmet breakfast made fresh daily at Lake Pointe Inn, you will find wonderful dining options at local establishments. Dutch’s at Silver Tree specializes in seafood and offers lakefront dining. Deer Park Inn offers French-style service and fine wines. Mountain State Brewing Co. is known for its wood-fired pizza, salads, and beer. Canoe on the Run is a great place to grab a salad, soup or sandwich for lunch. 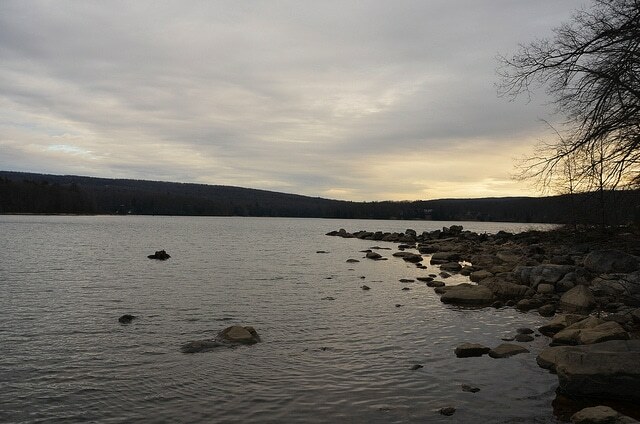 Deep Creek Lake has many opportunities to enjoy the great outdoorsin all four seasons. Take advantage of cooler temperatures in summer, incredible foliage in fall, fresh powder in winter and abundant flowers in spring. As far as activities go, swim, fish, canoe or kayak in Deep Creek Lake; hit the trails on foot or on a mountain bike; enjoy cross-country skiing and snowboarding; or see things from a different perspective on horseback. Golfers never fear, Wisp Ski and Golf Resort offers two golf courses, one of which was named one of the “100 Must-Play Courses of the Mid-Atlantic. Plan to fit a little pampering in between attending local events, shopping and your outdoor adventures. Lake Pointe Inn offers Swedish massages, hot stone therapy and reflexology to inn guests. For your convenience, book your spa appointment when you make your room reservation. Lake Pointe Inn is one of the many reasons you should visit Deep Creek Lake. Our McHenry, Md.,bed and breakfast sits 13 feet from the water’s edge of Deep Creek Lake and offers three suites and seven guest rooms, each with a gas fireplace and private bath. Begin each morning with a delicious gourmet breakfast in one of our dining rooms and end each day relaxing by the fire in our living room or by the fire pit sipping hot cocoa and roasting homemade marshmallows.